Flipping on the radio to catch the start of CBS news radio’s World News Roundup and hearing that the lead story about a fatal accident that happened about a mile away was very disconcerting. The report informed listeners about the deaths of several college students, visiting the USA from Ireland. They had been killed when an apartment house balcony collapsed and spilled them onto the sidewalk five stories down. The exact location of the tragedy “in downtown Berkeley,” was not reported nor was it clear when precisely the event had occurred. We barged into a neighbor’s pad and when we saw the first live coverage it still wasn’t clear where the tragedy had occurred. A tight close up of the dangling shards of balcony didn’t give us a clear idea of exactly where the deaths had actually happened. We went downtown and saw that the tragedy occurred just west of the Berkeley Public Library’s main branch on Kittredge Street. We took a few photos of the site and then after doing some photo editing work back at the World’s Laziest Journalist home office, we sent two photos to the BBC. After sending those images we noticed that the BBC website had a tight aerial view of the balcony. We had to ask a police officer when the Berkeley PD had received the call to get an approximation of when the collapse had occurred. “Early this morning” does describe 12:42 a.m. but just not with complete accuracy. 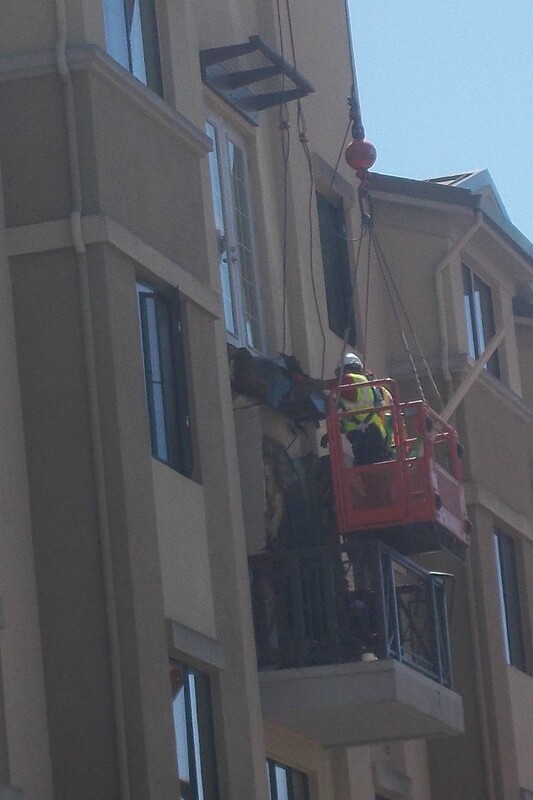 Tuesday, KCBS was reporting late in the day, that evidence of “dry rot” had been detected in the balcony support. In Berkeley, the allegation was being made that the company that built the offending apartment house complex was proceeding rapidly with a new development in the downtown area. If true that will mean that hearings and lawsuits will prolong the scheduling of the new project and that local journalists will be covering the long term effects of the balcony collapse for years to come. Who doesn’t love the idea of spending the summer fact checking the construction of a ten year old apartment house? In San Francisco Chronicle for Wednesday June 17, 2015, the lead article was reporting “it appeared rainwater had penetrated the balcony’s wood structure, causing dry rot that weakened it.” The blame game with accusations and denials was on. By Wednesday afternoon, KCBS was reporting that students who lived in the building were expressing negativity about the building itself. Isn’t it obvious that if the building is going to symbolize American greed and political corruption and become a destination for pilgrims from Ireland, then it will have to be demolished? Will conservatives assert that assessing the quality of material used in completed real estate projects is unnecessary government meddling? However negligence that results in deaths can become a criminal matter. If the apartment house building becomes a folk symbol of American greed and political corruption, will the conservative talk show hosts keep the topic alive as a way of embarrassing President Obama? Will nostalgia for the days when America was respected and revered become a theme for the Republican Party’s nominee to become President in the 2016 election? 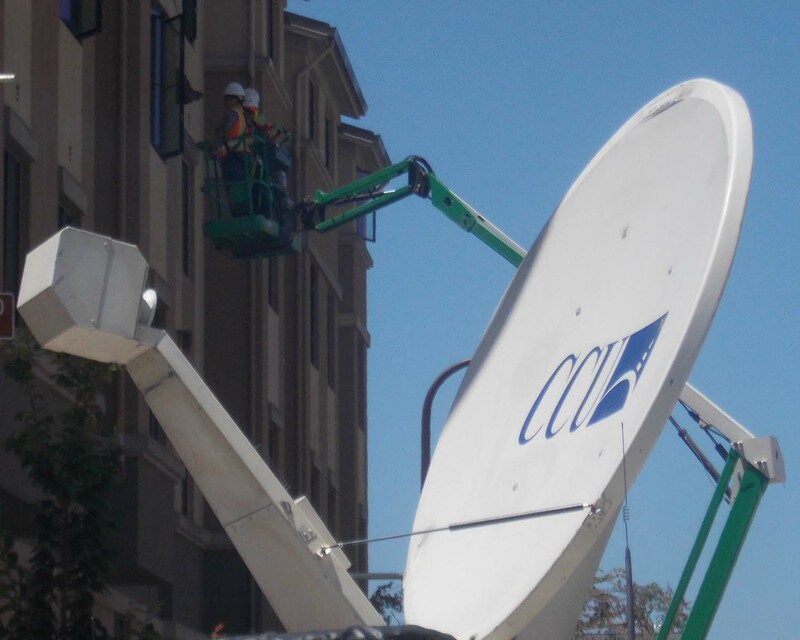 The mainstream media in the USA was switching its focus from Berkeley to gun control as the weekend approached but the media in the Berkeley area remained concentrated on the details of the construction of the balcony and the tragedy. People outside the area will find extensive coverage of the latest developments on both the Berkeleyside (dot com) and Berkeleydailyplanet (dot com) websites. By the end of next week, journalists and pundits will be trying to make cogent remarks about the latest Supreme Court decisions. Few predictions about how a Supreme Court with a conservative Christian majority will rule on an issue they consider an abomination against nature, so it seems that it might be time to round up the usual clichés about “no one saw this coming” no matter which of the binary choices is the end result. Is the principle “we report; you decide” a bit disingenuous because a reporter who covers a story for years will have a much better ability to see the most likely course of action rather than would a reader who is new to the topic? “We distort so that you can jump to an erroneous conclusion” sounds more like capitalism in action, eh? Do reporters who cover Hollywood do better at predicting Oscar winners than do members of the movie going public? What decision about the abomination against nature do you expect? Various news stories will compete to become the iconic event that will always symbolize the summer of 2015 in the collective consciousness, but for the country of Ireland and the City of Berkeley CA, it seems that nothing else will eclipse this week’s tragedy. The world’s laziest journalist would strongly prefer to write snarky columns about futile searches for prison escapees, various Supreme Court decisions, and futile efforts to recruit solders to be trained in Iraq rather than cover a very sad local angle to something that comes close to qualifying as a shameful international incident. Updates will be included in future columns as warranted by developments. Now the disk jockey will play Elton John’s “Candle in the wind,” the Cranberries’ “I can’t be there” and U2’s song “Sunday bloody Sunday.” We have to go get our Irish up regarding finding out what political election campaign donations may have been made by a notorious construction company. Have a “may the wind be always at your back” type week.